In today’s social media-driven world, it seems like your life stops whenever you’re forced to disconnect. From Facebook to Instagram and even just texting your BFF, our phones often feel permanently glued to our hands. But there’s one place where you could actually lose your life by trying to stay connected: the driver’s seat. According to the U.S. Department of Transportation’s National Highway Traffic Safety Administration, 3,450 people were killed in motor vehicle crashes involving distracted drivers in 2016 alone. (Distracted driving covers everything from adjusting the radio to eating/drinking to applying makeup and, you guessed it, texting or talking on your phone.) And texting has become a disturbing trend among millennials, with 16- to 24-year-olds using handheld electronic devices while driving at higher rates than older drivers. Women are especially at risk as they’re more likely to be involved in fatal distracted driving crashes compared to male drivers. But there are steps you can take to avoid becoming a statistic. 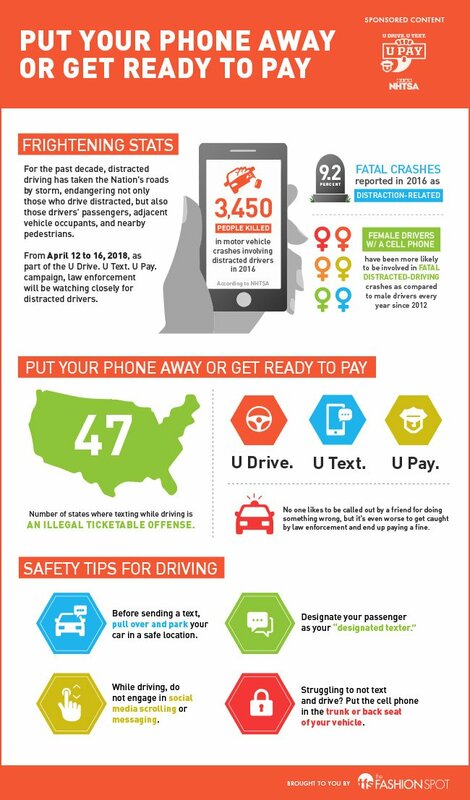 Check out the graphic below and remember: when you’re behind the wheel, remember to put your phone away or get ready to pay.